was a guest at the AM in Pravets. In cooperation with Secretary Ana Cruz we prepared a written invitation for the Newsletter for proposing small group topics. In cooperation with vice-president Krzysztof Cieplinski we are preparing poster sessions in the conference and Annual meeting. RAIP from Serbia. This application is now ready for newsletter having been read by two members of the Committee Zoli Figush and Eva Varro as well as myself. Any questions we had were small and quickly answered by the committee. There is a slight difficulty due to the political situation in Serbia. It was not possible to obtain a recommendation letter from a Serbian. However they provided two good recommendations from Peter Haworth and Monica Westberg. In addition they provided one from Valerie Monty Holland a Sociodramatist accredited by BPA who has provided Sociodrama training for RAIP. Finally they obtained a reference from Zoran Ilic, a Serbian, who is well known to FEPTO. The second institute who are, ICPP from Russia were a little late in their application but I now have all required documents. I am awaiting response from the first reader Sofia Symeonidou. The second reader has not yet received the documents due to my inefficiency, which I hope to rectify within the next few days. I have no concerns about the application. Dear Colleagues I am please to introduce myself as the new Chair of FEPTO Membership. Already I have been busy with two applications from Institutes and a third in process. In addition we have an application for Organisational Membership. Please remember to watch for the publication of all applicants in the winter issue of FN. One last thing, I desperately need people to read applications. It seems to fall to a small band of people who have been doing this for years. While experience is wonderful succession in my opinion is Vital! Do give this some thought. In UK certainly, hours spent doing this work can count as CPD, especially for Trainers. It is not complex work and I am trying my best to make even that easier. And it can be done from the comfort of your own home. The FEPTO Council is focused on the challenges that the Federation and each Member Organization have to face in this new era of psychodrama: The XXI Century Challenges. Across Europe and the Middle East, new scientific, economic and political changes are emerging and the Psychodrama Community must face them “eye to eye, face to face”. These changes not only affect the dynamic evolution of psychodrama, as psychotherapy, but also its place among other psychotherapeutic models. At the Annual Meeting of Óbidos in 2014, the needs of our Community became clear with the results shown by the Delegates of each Member Organization, with the findings of the subgroups targeted by the theme of “Psychodrama Trainer’s Core Competencies”. The needs of the Delegates are the needs of the Organizations they represent. We cannot forget that competencies such as Research and Promotion, on top of the needs, followed by Self-care and Assessment, are FEPTO targets and duties to its Members. As an umbrella Organization, FEPTO has to create the necessary synergies to promote networking in order to fulfill these needs. In this framework it is important to refer that the Membership Committee is not only the gateway to the reception of new applications for future Members,but also an environment of reflection and networking with the other chairs of the Council, in order to find new procedures and new strategies to successfully cope with the new challenges ahead. This work does not intend to obstruct the access of belonging to FEPTO, or to exclude members, but rather to enable this Federation to increase its influence and became a stronger landmark, both for its Members and for Society. This is the main goal of the Council to respond more promptly and accurately to the demands of the Members. With a stronger FEPTO we will have a stronger voice in the world. FEPTO has throughout its life incremented an increasing gradation of requirements and responsibility of its members. Our credibility and influence depends on that, so we must all join our strengths in the common desire to improve our efficiency and effectiveness. After all, FEPTO is nothing more than its Members. Concerning this aim the Membership Committee reformulated all the requirements and elaborated with the other chair-persons new definitions. We have to know where we stand. The Membership Committee has the pleasure of sending you the Application of the Organization which will be voted in the General Assembly of Lisbon 2014. The name of the Organization is “Trondheim Psykodrama Instiutt As”, from Norway. As the new chair of Membership Committee, I thank Eduardo Verdu for handling over a well prepared and organised chair and for explaining to all the Committee Members the aims and the guidelines of this Committee. – To build form that might help to collect information in order to built a database about the new and old Members of FEPTO (Zoran Djuric may already have some of this information). FEPTO is growing and we are growing fast. 7 institutes where voted for in Oslo and for Santander we have 7 more institutes applying. All institutes will be presented in the 13.1/March Newsletter supplement. We remind the members of the revised voting procedures. :When an institute is considering applying for membership the first step is to come to the Annual Meeting once as guest. In the year that they choose to apply there is a timeline. The application should be sent as early as possible but not later than, the end of September. During the month of October the application files will be prepared by the Membership Committee ready for the Council meeting, the first weekend in November. The Committee will engage in a dialogue with the applicant if necessary and may ask for further clarification. Since our last meeting in Jerusalem, we have received 8 applications for membership. CEPSI from France did not meet the criteria and will therefore not be presented for voting at the GA in Oslo. Cyprus Mental Health Institute decided to postpone their application until Santander in 2013. The 6 other applicants are ready for voting and you will find a presentation of them in this newsletter. In addition, the institute Amigdala from Macedonia, who applied last year, will be voted for in Oslo. When an institute is considering applying for membership the first step is to come to the Annual Meeting once as guest. In the year that they choose to apply there is a timeline. The application should be sent as early as possible but not later than, the end of September. During the month of October the application files will be prepared by the Membership Committee ready for the Council meeting, the first weekend in November. The Committee will engage in a dialogue with the applicant if necessary and may ask for further clarification. When the Council accepts this application it is then sent as PDF file to all members. The membership is invited to submit any relevant question to the Chair of the Membership Committee 6 weeks prior to the GA. This leaves 4 weeks for any issues raised to be resolved. After this period no more questions may be raised. The applicant may withdraw their application at any moment. If a resolution cannot be agreed then ratification of membership will not be asked at the General Assembly in that year. This proposal will be put to the GA for voting and cannot be instigated until this happens. Therefore this year we will hold to the old system. I heard many voices in Jerusalem with opinions on both voting procedures and membership criteria. Some members have sent their thoughts. Any thoughts and suggestions for these procedures will be very much appreciated. I look forward to meeting you all in Oslo. As the new chair of membership, I thank Dana Dragoteanu for handling over a well prepared and organised chair. It is a great pleasure to take over this chair and I know I will benefit a lot from what this committee has accomplished throughout the years.This committee looks totally different from when I first entered it for short period, many years ago. During the last few years the amount of membership applications has increased heavily and the amount of work has of course grown steadily with the numbers of applications. The demand for more structure, guidelines and clarity in the process of becoming a member is a result of our organisation growing quite fast. The increased numbers of membership applications have also been very visible in the General Assembly, where every year more and more time is designated to new applicants and voting. – To collect ideas from the members and listen to their experiences in applying membership. – To go through the criteria for becoming a member of FEPTO and see if they need to be changed or adjusted a growing organisation in modern times. – To create more specific guidelines for handling applications. – To create easy information channel between the Chair and FEPTO members in order to prepare the members well in advance before a General Assembly by passing on information to them about new applicants. – To look through the voting procedure at the General Assembly and see how this can be done smoother. – To have a look at dormant memberships. This Institute should present itself next year, but, for now the person who recommended it withdraw her recommendation and I didn’t receive a new one (although I reminded this Institute about this fact) until now. – For ISI Institute fur Soziale Interaction Hamburg, Oxford School, Swedish School in order to complete their documentation with the necessary recommendation.Because of the precedent created to withdraw a recommendation letter without any explanation, I consider that we should think of a rule that can regulate this kind of situations. I think that a person who recommends an Institute must be responsible for this fact and the withdrawal must be justified, otherwise it can affect FEPTO. It must be reminded to FEPTO members that they recommend the Institute and not the person. This kind of situations can do harm to the image of that Institute in FEPTO and can create ethic suspicions. A. Decisions taken in the Ghent Council meeting:1. Some institutes applied 4 or 5 years ago but did not meet requirements at that time. It was agreed that these institutes will have an announcement in FN and will need only to present a poster or a power point at the AM. If this requirement is not met then they cannot be voted on. 2. An institute cannot attend as a guest until they have graduates. An application can be made in anticipation of graduates but will not be invited as a guest until all requirements have been met. The institute can only be represented as a guest once. The year following as a guest they can present and be voted. To meet requirements means at this point in time not for the future. Interested institutes can attend the conference at any time. 3. The application fee must be paid as part of the application regardless of outcome. €200 for Western Europe and €100 for countries in Eastern Europe who are named in the reduced category. 4. The Institutes shall know that any essential change in their structures or training program must be announced, in order to update each situation. 2. Psychodramaforum Berlin, GermanyInstitutes that have already presented themselves and are ready for voting now:1. Helsinki Psychodrama Institute (Sirkku made the presentation last year, in Ghent). 2. Swedish Psychodrama School (they will have a short power point and poster presentation as they already introduced themselves in Helsinki). 3. Ecole Française de Psychodrame – Paris, France (they will have a power point and poster presentation as they already introduced themselves through Anne Ancelin Schützenberger a few years ago). 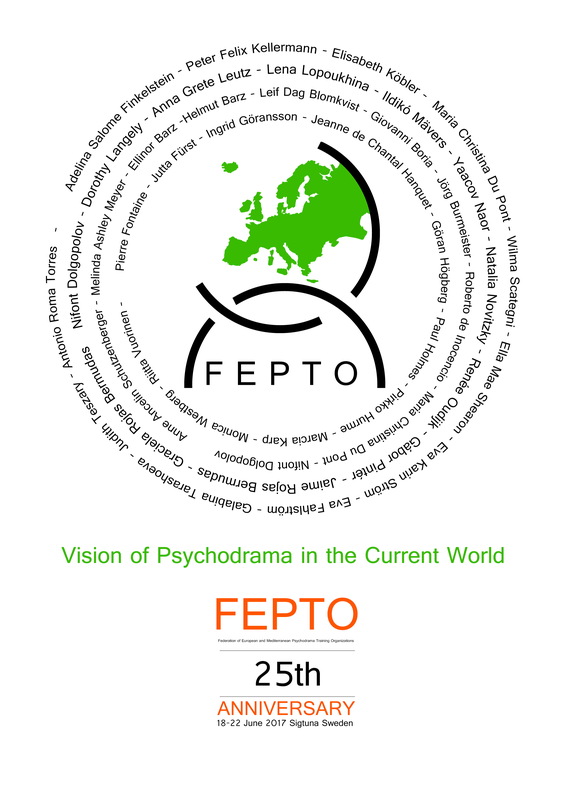 Until now, two new organisations, that were guest in Ghent, have applied for FEPTO membership: Polish Institute of Psychodrama Association and Psychodrama Forum Berlin, Germany. Also, a new one that presented and is to be voted in 2010, Belgrade, is the Helsinki Psychodrama Institute. We have also received a letter from Swedish School of Psychodrama, signed by Kerstin Jurdell, that presented their Institute in Helsinki, in 2004, asking to be voted next year in Belgrade. Their main trainers are Kerstin Jurdell and Per Henriksson and they have 14 students and three certified persons. Up to this moment, there are some guests that announced their participation in the Belgrade FEPTO Annual Meeting: The Macedonian Psychodrama Association “J.L. Moreno”, Skopje, delegate Filip Babamov, president, and The Red House Centre for Culture and Debate,Sofia, Bulgaria, delegate Tzvetelina Iossifova, Director of the Centre. 1. If in a Committee, there are no members, the Council members shall automatically become members or the old chair of the respective committee, shall maintain their position for another year. 2. The Institutes shall know that any essential change in their structures or training programs must be announced, in order to update each situation. 3. The FEPTO Members should be recommended, that when they write recommendation letters, they should also know the program of that Institute (some of them usually recommend the persons from the Institute and not the training program.